China's profound influence on the avant-garde in the 20th century was nowhere more apparent than in the work of Ezra Pound, Bertolt Brecht, and the writers associated with the Parisian literary journal Tel quel. Chinese Dreams explores the complex, intricate relationship between various "Chinas"—as texts—and the nation/culture known simply as "China"—their context—within the work of these writers. Eric Hayot calls into question the very means of representing otherness in the history of the West and ultimately asks if it might be possible to attend to the political meaning of imagining the other, while still enjoying the pleasures and possibilities of such dreaming. The latest edition of this critically acclaimed book includes a new preface by the author. Eric Hayot is Professor of Comparative Literature and Director of the Asian Studies Program at Penn State University. "Chronicling an obsession, Hayot applies the right dialectical tools: a nice freedom in choosing how seriously to take claims, an extraordinary sensitivity to detail, and an inclusive sense of context. In a field burdened by oversimplifications, he manages to preserve both analytical complexity and clarity. His re-readings of texts grown tired through overuse as examples are fresh and should set discussion going on new paths." "In this carefully researched and lucidly written book, Eric Hayot takes on the formidable task of reexamining avant-garde European intellectuals' uses of 'China' for purposes of aesthetic and political inspiration, renewal, and edification. Despite their obvious orientalism, he argues, 'Chinese dreams' remain instructive as symptoms of a collective desire whose manifestations have much to tell us about the development of Western thought in the twentieth century. A truly impressive accomplishment." "Instead of trying to decipher the indecipherable 'China' in Western literary texts and critical discourses, Hayot chose to show us why and how 'China' has remained, and will probably always be, an enchanting, ever-elusive dream. His approach is nuanced and refreshing, his analysis rigorous and illuminating." "This superbly original book is a stimulating contribution to the field of East-West comparative poetics." 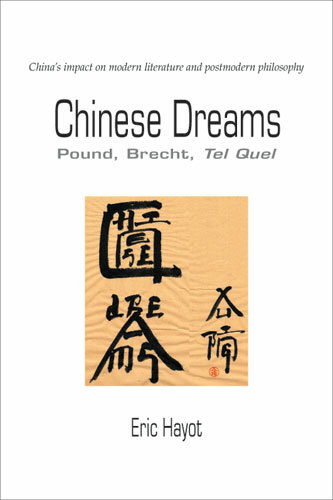 "Chinese Dreams chronicles the obsessive dreaming about China in twentieth-century America, Germany, and France...The book challenges - with theoretical sophistication and close readings - the assumption that Chineseness has remained a crystallized concept throughout history...A lucid and accessible book, Chinese Dreams is an important contribution to the field of East-West comparative studies, Asian studies, and modernism. Its structure makes it a pleasure to read for both scholars and students of literature."